Since this report was originally published, the Israeli campaign of murder and brutality has intensified with airstrikes in Gaza and more house raids in the West Bank. 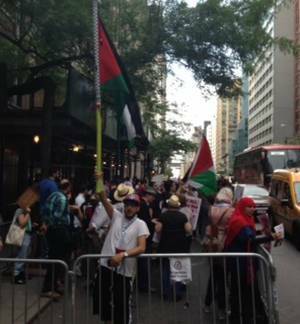 Demonstrators gathered in front of the Israeli eEmbassy on 42nd St. and 2nd Ave. in New York City on June 25 to denounce the human rights abuses being committed against the people of the occupied West Bank. Chanting “When people are occupied, resistance is justified” and “From the river to the sea, Palestine will be free,” the New York City crowd expressed solidarity with the besieged West Bank. On June 12, three Israeli teenage settlers were reportedly hitchhiking in a settlement north of Hebron in the West Bank and were kidnapped. Since then, the Israeli state’s response has been to collectively punish the entire population of West Bank for the disappearance of these three individuals. Five Palestinians have been killed and 527 people have been arrested by Israel in the current military operation. Not since the Second Intifada in 2000 has the West Bank experienced such an intensification of police raids and abuse. The United Nations Security Council has refused to denounce these Israeli crimes against innocent families.